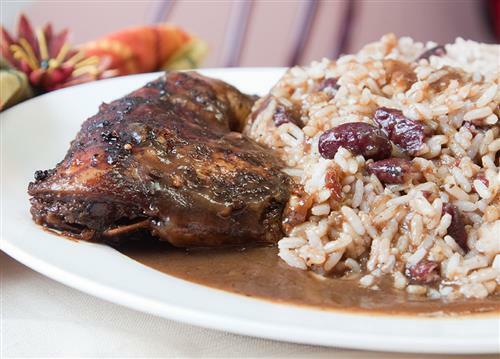 If you want the real authentic flavor of Jamaica, then Jamaican Jerk Chicken is the spicy hot island classic you're looking for!&nbsp;Not only does it taste amazing, but our recipe pairs well with everything from Jamaican Rice and Peas to Callaloo and Dumplings. It's simple to make and won't make you take up half the day in the kitchen either. In a large bowl, combine all the ingredients with about ¼ cup of the Jerk Seasoning. Mix well and let marinate in refrigerator overnight. Prepare grill on medium-high heat (If using oven, cook at 375F for 30-45 mins until well done). Combine ¼ cup of jerk, ketchup and calypso sauce. Place chicken on grill rack and coat with ketchup mixture. Grill for about 20 mins or until done, turning occasionally. Serve with rice, vegetables, dumplings, or even more jerk chicken! Enjoy!